The Digital Debate, The Online Battleground... this is the year that search, social media and sharing became power players in politics. If there’s one thing that distinguishes this general election from any that have gone before, it must surely be the astounding role that the internet and social media have had to play. While newspapers, public appearances and party political broadcasts still have their place, nowadays you could be forgiven for thinking that, if a politician’s not tweeting about it, nobody’s listening. Not that long ago many would have found it hard to believe that ‘Clegg ahead in Facebook leader race’ was a serious headline, yet with not only politicians but much of the media jumping on the bandwagon, social media has never seemed so important. Never one to miss a trend, Google has made the most of the ever-flowing online debate by creating UK Election search trends, a new service which presents an analysis concerning all aspects of the election and shows who, or what, is garnering the most searches. The search data can be filtered by a number of different categories: the leaders, Chancellors and parties. Google then presents a table of search percentages and a line graph allowing the user to track the trends over a certain period of time. Of course there is the danger here of getting search trends confused with the actual election outcome. People searching Gordon Brown online are just as likely searching for YouTube videos of him calling someone a ‘bigot’ as they are researching his policies. The last tab is, then, perhaps the most interesting of the four. 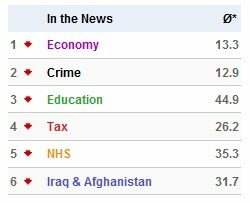 ‘Topics’ presents the data for searches on the main subjects of political debate such as economy, crime and education. This makes it possible to see exactly which topics the online community is most concerned about or interested in, certainly food for thought for any politician. Google also provides readers with up-to-date information about the current MP and candidates in their constituency along with the results from the last election in that area. In another tab, a link to YouTube’s Digital Debate offers a series of videos in which the three main leaders answer questions submitted through Facebook. Users are then able to vote on who they think answered the question best. 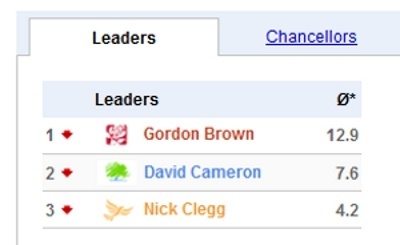 Google’s ‘General Election: 2010’ is just a drop in the ocean, however. Almost every news and media website has up-to-date election coverage, politicians have pages on Facebook and Tories have Twitter. If the success of Barack Obama’s online campaign is anything to go by, UK politics is on to something and it just remains to be seen if social media in the UK will have as much influence on the outcome of the election as it did in the USA. If Facebook and Twitter are clamouring for Clegg, will he be the new PM? And with so much of the political debate held on the web, how long will it be until we’re voting online? Keep up with the election coverage tonight on Twitter using hashtags #ge2010, #electionday, #ukvote and #ukelection.